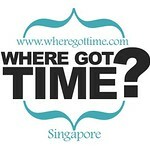 Where Got Time Singapore - Your Personal Assistant, Errand Runner & Concierge Service: What is a Personal Concierge? Singapore is a fast-paced city where we justify every minute's worth. It’s apparent the way we function today, consumers of our time make decisions based on anything that promises more convenience than ever. Personal concierge is the new time convenience and commodity, it is a rising trend for time-starved clients spreading across the nation. Personal concierge provides everything from domestic assistance to business resource management for busy individuals and professionals for more focus and productivity in life, see services here.